I got a grievance to air. 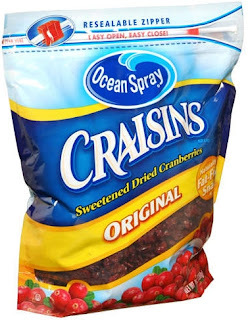 How in the world are Craisins still on the market? 2008 marks the 15th anniversary of these little boogers. Let's back it up. Or as George Costanza would do, picture George's palms beckoning you towards him as he goes "beep...beep" I was the first person in line, prepared to sing from the rooftops about this amazing hybrid invention. I like cranberries. I like raisins. Ergo, no doubt I would LOVE craisins! So imagine my dismay when I find out they are none other than freakin' dried cranberries!!! As a marketer, I should praise them for their ingenious way of duping consumers to pay double the price for a product that is as old as Thanksgiving. However this is one of those times when being a marketer and a civilian are in conflict. I am so offended by Craisins that I might have to start a boycott petition. Fro Yo and W suggested I share my Craisin gripe with the blogging community, so I dedicate this gripey post to them. awful! they're disgusting. i'd rather eat raisins. and i don't like raisins. Since raisins are dried grapes wouldn't your dream hybrid product really be a cross between cranberries and grapes that is then dried? Oh wait...a cranberry grape cross would be probably be called "crapes." Imagine the rant you would have on a fruit product called "dried crapes." Regardless, Craisins rule and get used to it. They are here to stay. Long live Craisins! I absolutely love Craisins. I can't get enough. I'm eating them right now. I turn the bag up and pour them in my mouth by the mouthful. I just ate some on my salad earlier today. I have a bag at home and a bag in my desk at work at all times. I may even start keeping a bag in my car. And that is why they are still on the market.